The new European-wide Common Footprint Quality (CFQ), promises stackable, top quality, fit for purpose corrugated packaging. CFQ accredited trays deliver the protection needed by delicate fruit and vegetables, giving growers and retailers assurance that their fresh produce will arrive in store in optimum condition every time. CFQ builds on the FEFCO Common Footprint (CF), which harmonises tabs and noses of corrugated trays throughout Europe. 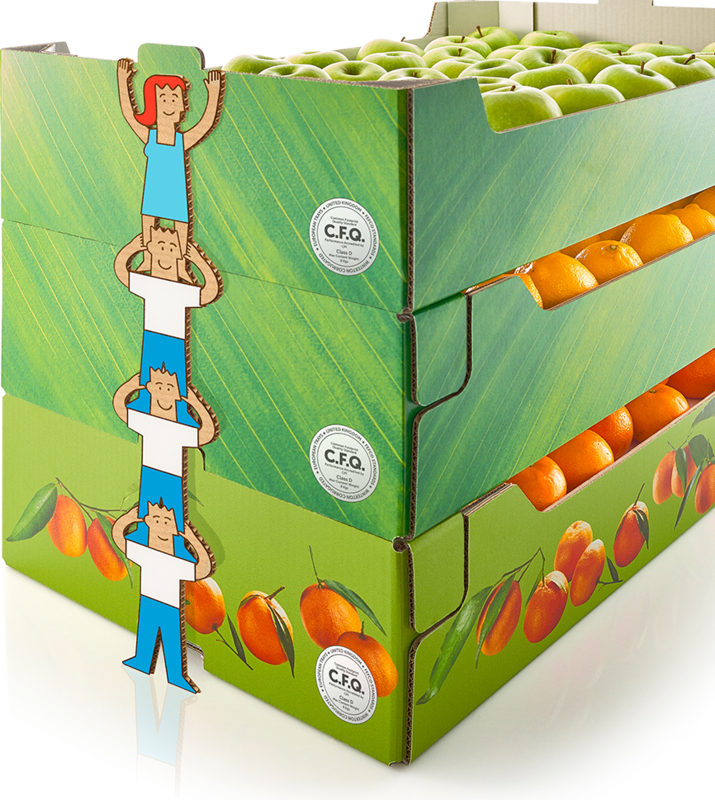 CF guarantees the stackability that allows growers and retailers to handle transport of fruit and vegetables efficiently; the Q promises quality and strength. 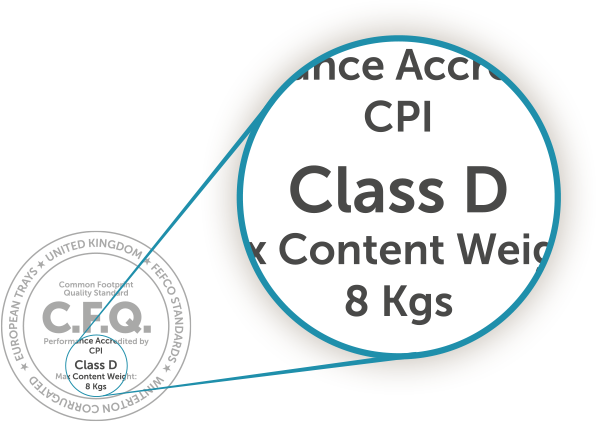 The strength and durability of any tray carrying the CFQ stamp has been rigorously tested to ensure it is fit for purpose while optimising handling and transportation. Light and modular, with standardised bases and variable heights, CFQ trays offer the best weight to volume ratio for shipments, maximising truck loads and minimising transportation costs. The modular CFQ trays are strong and fit for purpose. In Europe, all trays with the CFQ logo are compatible, facilitating handling and logistics operations. Use of the CFQ stamp is only granted to corrugated manufacturers once their trays have been audited to ensure they meet CFQ’s strict technical specifications. The Box Compression Test verifies that CFQ trays stacked on a pallet, especially those at the bottom, are able to support the weight of those above without being crushed. The Static Bottom Deflection Test verifies that CFQ trays are resistant to sagging under the weight of produce, ensuring the fruit and vegetables in the trays beneath are kept safe. Water absorption tests (Cobb method) verify that, when kept under the correct storage conditions, the corrugated in CFQ trays can absorb a defined amount of moisture or fluid while maintaining the characteristics of the tray. This perfect combination of space optimisation and ideal packaging weight optimises transportation, allowing companies to reduce fuel consumption and CO2 emissions – saving energy, cost and the environment. All tray testing is performed externally under standard conditions prescribed by FEFCO and continuously monitored by the National Associations of Corrugated Board Manufacturers. Their independent auditors use their own control laboratories to regularly audit tray producers. For corrugated manufacturers, non-compliance with the CFQ standards means increasingly dissuasive fines. They may even be banned outright from using the label. 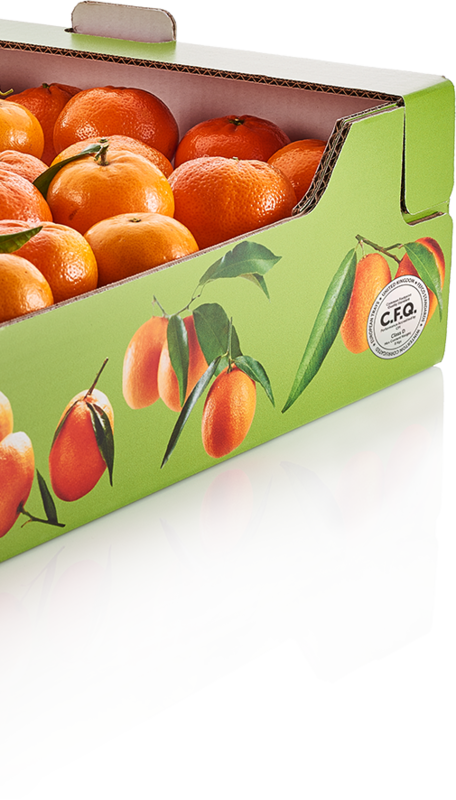 Like all corrugated packaging, CFQ trays are perfectly designed for displaying fruit and vegetables. Their printability makes them an ideal communication and promotional tool for growers and retailers. By conveying information on quality, ripeness, brand, country, locality of origin and more, in attractive full colour, they help to increase sales. 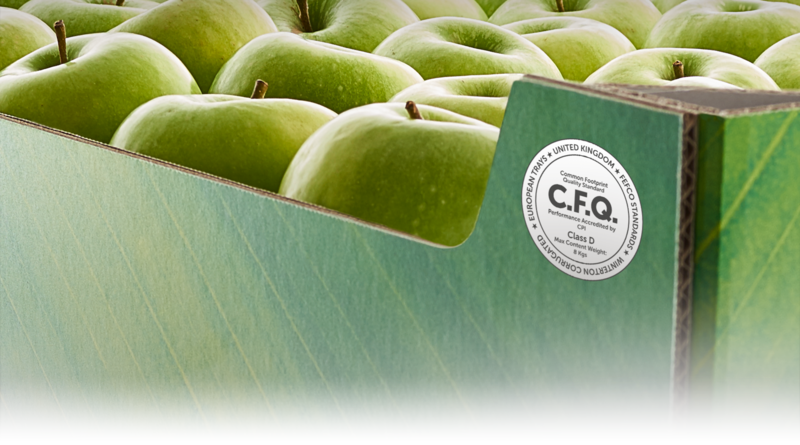 As corrugated packaging, CFQ trays are designed to take particular care of all kinds of delicate produce. They provide perfect cushioning, control ventilation, mitigate temperature changes and keep dust and light out. Only ever used once, the trays are always new and perfectly clean. Rigorous scientific research [LINK re Bologna study] has proven that corrugated trays expand shelf life of fruit and vegetables with up to 3 days. Corrugated packaging cares for the environment too: it’s 100% natural, 100% renewable, 100% biodegradable and 100% recyclable. Retailers bale their used trays, then send them a local recycling facility or paper mill. More than that, corrugated itself is made of 88% recycled materials. 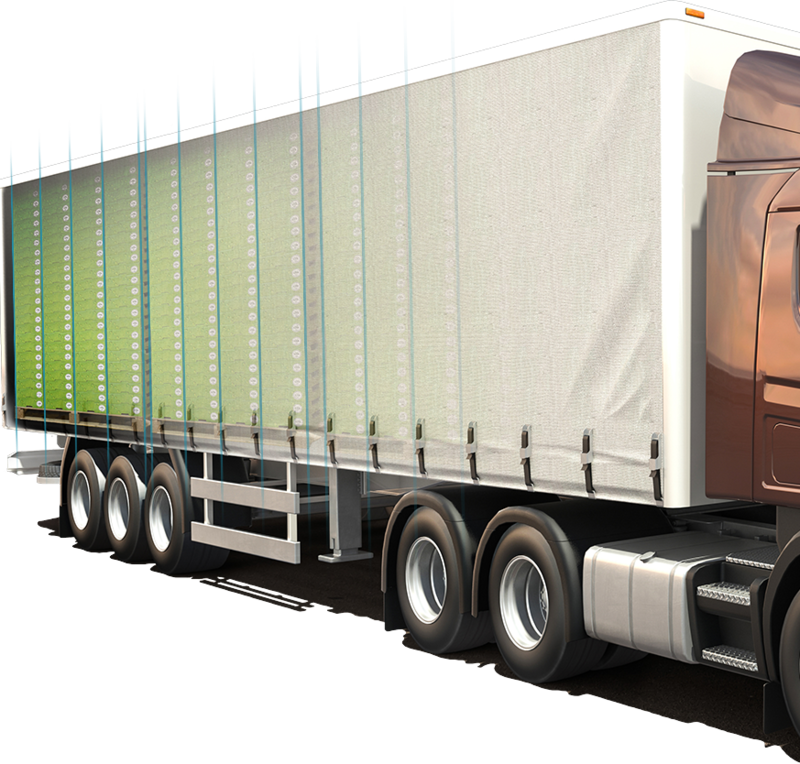 CFQ tray’s stackability optimises truck space and transportation, saving energy and costs while reducing CO2 emissions and waste. control system to ensure their members meet CFQ’s strict technical specifications.